NEB has published Grade 11 Grade Increment Examination Routine 2075. As per notice, NEB Grade Increment examinations would begin from 14 Poush, 2075 (2075/09/14). The examinations will start at 11:00 am and conclude at 2:00 pm. click [ HERE ] to view Class 11 Grade Increment Examination Routine. National Examination Board (NEB) has published notice (amended notice) regarding Grade Increment for the students of Grade 11. Students are requested to submit the application form by Mangsir 16, 2075 (December 02, 2018) to their respective colleges. The examination fee is Rs. 600 . The examination routine and examination center will be published later. Students who have secured C, D+, D and E Grade in any subjects are eligible to give the examination in two of the preferred subjects. National Examination Board (NEB) has published an urgent notice regarding Grade Increment (Chance) Examination for the students of Grade 11 who have participated in grade 11 regular examination held in Baishakh/Jestha month.Earlier, The National Examination Board (NEB) published the result of Grade 11 on Saturday evening. According to the notice published by the board, a total of 548,445 students appeared in the exam among which 332891 students appeared in regular examination whereas 176,049 students appeared for grade upgrade examination. Similarly, 39,505 students appeared in non-grading system examination. The chance examination will be held on Mangsir 8, 2075. The examination time is from 11 AM to 2 PM. 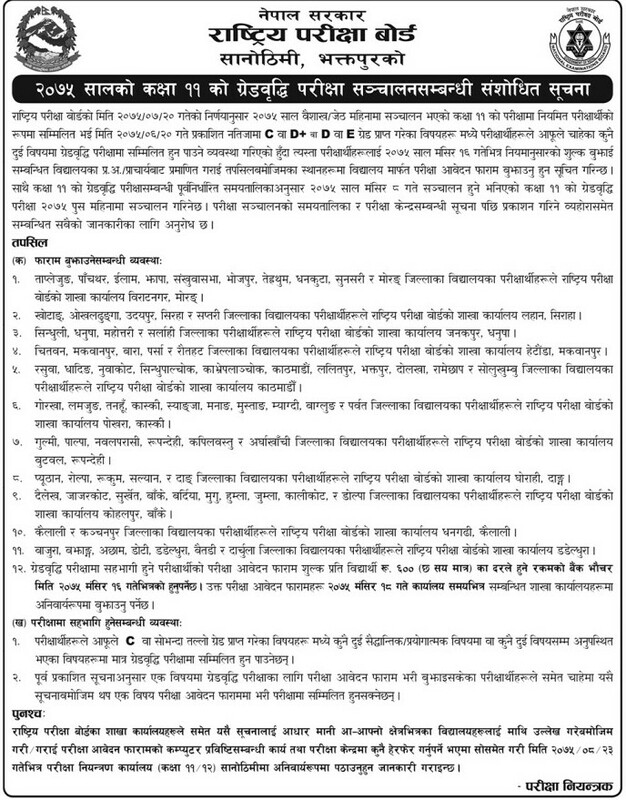 Application form Deadline: Kartik 28, 2075.